A prosthodontist performs reconstructive and cosmetic dental treatments that are designed to enhance the appearance and functionality of the teeth. A person who undergoes prosthodontic treatment will typically experience long-lasting results that look natural and restore the patient’s ability to chew and speak normally. The only way of knowing which types of treatment is right for you is by consulting with a prosthodontist. However, many patients who wish to improve the aesthetics of their teeth and gums do so using dental crowns, which are prosthetics designed to mimic the natural appearance of a tooth. Veneers are also a popular option, which allows patients to retain their natural teeth, covering them with a thin ceramic shell that is bonded to the surface of the tooth. Veneers work well for treating stains, chips, and unevenness. Many patients visit prosthodontists because they are in need of a total or partial smile reconstruction. There are several ways of treating severely damaged or missing teeth, one of which is by replacing them with dental implants. A dental implant is placed within the jaw bone, where it acts as a prosthetic tooth root. Implants can be used to anchor crowns, bridges, or event partial and complete dentures. When properly cared for, dental implants can last many decades and in many cases, a lifetime. I am already seeing another type of oral specialist. Can I still use a prosthodontist for my reconstructive or cosmetic restoration needs? Yes. 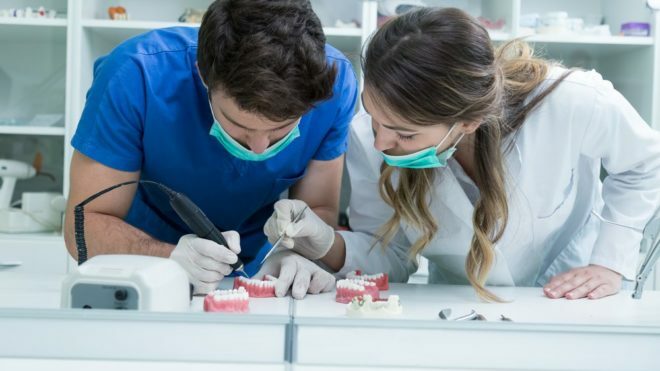 Prosthodontists often work with other dentists and oral specialists to synchronize treatment progression and ensure the best possible outcome for their patients. If you think you could benefit from prosthodontic treatment, contact our office to find out how you can schedule a consultation as soon as possible.